Developed from a line of very similar aircraft, the AT-6 'Texan' trained more pilots than any other aircraft before or since. Pretty impressive comment, but pretty much true as nearly all US pilots trained at one time or another in a variant of the T-6 as did most Commonwealth pilots and many after the war. The predecessors of the AT-6 were already being used in the late 1930s, though in relatively small numbers. With prospects for peace in Europe looking murkier by the day, the US Army Air Corps began placing record orders with North American for the AT-6. Where the Inglewood plant was accustomed to orders of ten to 75 aircraft, suddenly they were faced with the problem of turning out a thousand or more copies per "batch". It became apparent a new plant would have to be built to take some of the pressure off of Inglewood. 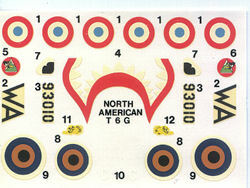 The site chosen was Dallas, Texas, where the AT-6 acquired the name "Texan". Dallas began production in December 1940 and turned out by far the largest quantity of AT-6s of any North American plant..
None of the records agree on just how many Texans were built. Sometimes the USAAF/USAF would buy hundreds of surplus AT-6s and have them extensively rebuilt. And sometimes these aircraft were counted as new. On the other hand, due to North American's bewildering model designations, "charge numbers" and service numbers, large quantities were actually built, but then redesignated as a different model or charge number, and somewhere along the line, historic information on the actual production numbers was lost. The best guess is somewhere between 12,000 and 15,000 Texans were built in the nine year production run of the T-6 Texan which ended in early 1944. 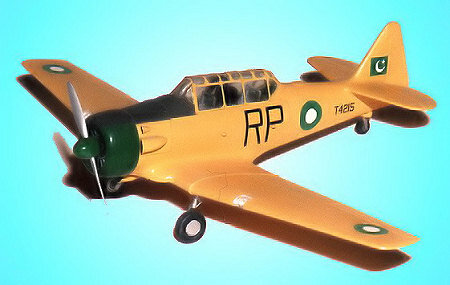 Postwar, many of these planes were even further modified for use by the US and air forces overseas as the T-6G. 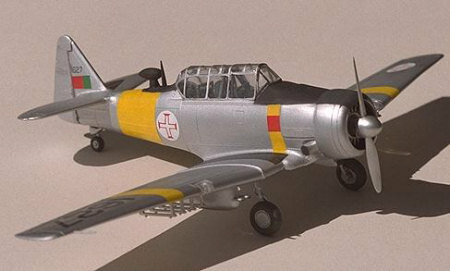 During its lifetime, the Texan was used as a bomber, fighter, a spotter ("mosquito"), a strafer, a "Brass Taxi" and a patrol craft, as well as an "Advance Trainer". Handling characteristics eventually improved to the extent that the instruction book could state "It will take approximately 4½ turns to recover from a spin" a far cry better than the original "Do not intentionally spin the aircraft more than 1 turn". This is one of the original Heller boxings of this kit. At the time, Heller was using the still-disliked end-opening box, which was rarely strong and often resulted in a crunched box/kit. Fortunately, when the entire line was renumbered, it came with a much sturdier two-piece box. It also came with a small tube of glue. Frankly, I seriously doubt if anyone would have been able to complete this kit with that tiny amount. Anyway, since this is an original boxing, the molding is in particularly good condition. The white plastic is a tad soft with superbly raised detailing. It has a rather detailed cockpit with a floorboard area, control sticks, seats and instrument panels. A roll over bar is also included. A nicely done engine front has a nice exhaust section and separate push rod piece. It is trapped between two cowling halves and has a prop with spinner. . The wing is a single lower piece with separate upper wing halves. Since this is based on a F rench aircraft, no gear doors are given, though they could be easily made from card stock if needed. What it does include are under wing machine gun pods and rocket pods as well as additional racks. These items are marked on the lower wing so if not using them, one has to sand off the raised marking locations. For the upper fuselage, alternate ADF loop antennas are provided. You also get a proper T-6G canopy (one piece) without the additional frames. I have built this kit many times over the decades and it is still an excellent little kit. Though it may have been surpassed by the Academy version, if you find one, don't pass it up. Here's a couple of them.